Danish Modern Style Lampshade for Antique, Vintage or Contemporary Chandelier, Wall Sconce, Hanging Pendant Light Fixture, Candle Holders. 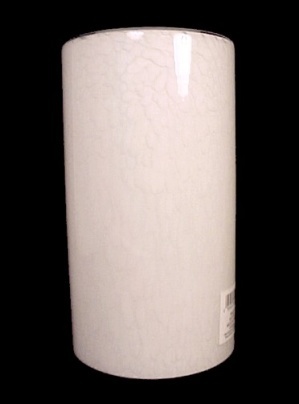 Blown, 3 cased glass layers, Clear over Splatter white, solid white interior, Cylinder Shape, Flat end, ground rims. Fitter Hole: 1 5/8" W without adapter, 13/16" W with adapter. Held in place with a screw ring (not included) on threaded light socket. Can be Used with Medium or Candelabra Base Sockets with the included adapter. Gently Used. No chips or cracks. Possible very light signs of usage.